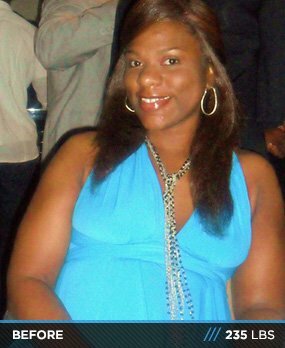 Body Transformation: Former Socialite Lost 80 Pounds! Laroyce enjoyed a thriving social circle that didn’t adhere to health or fitness. See why she hung up the party hat and found a team that whipped her into shape! Two years ago, I was 50-60 pounds overweight and knew I had to change my bad eating habits and lose weight. I was short of breath walking up and down stairs and experienced pain in my knees because of the extra weight I carried. After I committed to get into shape and lose weight, I searched for a trainer with knowledge and experience in the fitness industry. I found Mocha Lee, a former Ms. Galaxy and certified fitness pro, and started my fitness journey. At the time, I had a major setback because of a previous knee injury and wasn't able to do certain workouts. However, with a modified training plan designed by Mocha, I got back on track and fought through the injury—it didn't take long for my knee to gain strength again. Mocha introduced me to a group of young ladies who also worked out and had the same goals as me. 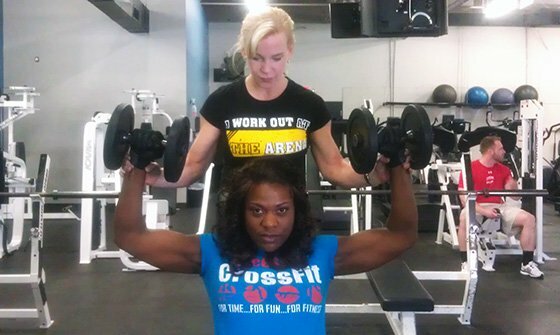 She formed a team to compete in a Tri-Fitness Challenge competition in Florida. While training for the Florida competition, I worked out once per week at a local CrossFit gym. Thanks to Coach Brian Belt, I increased my strength, speed, and lifting form. Mocha suggested that we also enter a bikini or figure competition since we were already in training mode. I took her word for it and she introduced me to trainer and IFBB pro, Stacy Wig, who guided me on more specific training, nutrition, and posing seminars. When I added the specifics, my body changed. I'm a witness and know you can change your body if you put your mind, dedication, and commitment into it. I inspired many of my family members and friends to lose weight and live a healthy life. In March 2012, I started to train for an August figure competition show and paired with Stacy Wig. She designed a custom nutrition and training plan based on my goals. I ate clean, followed her nutrition plan, stayed consistent with the workout regimen, and exercised 5-6 days per week. Stacy helped me transform my body in five months and got me "stage-ready" for my first NPC figure competition on August 25, 2012. She and Mocha Lee provided the support I needed to stay focused. I didn't think about quitting. I stayed focused on my goals and worked out with a team of women who were always positive and had the same goals as I. We were in it together and leaned on each other for support. The biggest challenge was the social aspect. I used to be a social butterfly and had to be at every event and gathering. I had to focus and sacrifice that part of my life since I had the desire to do well in a show. I knew I had goals to achieve, which meant sticking with the program and training schedule and saying "no" to most extracurricular events. If I did travel, I brought exercise equipment in my suitcase and packed food. My old habits changed quickly and it was for my best interest. If I went out with friends, I brought food along or ate before I left my house. That was a huge change, but I learned to balance my social life with my training. On August 25, 2012, I competed in my first figure competition in Maryland and placed second in master's figure and third in open figure. I did two more NPC figure competition shows and placed well. Next year, my goal is to get better conditioned/toned and compete in more shows until I get my pro card. I aspire to become a trainer and work out to inspire the younger generation. Once you get a taste of competition, it's like a bug that will never go away. It stays in your blood. Stay consistent with your workouts and nutrition. Believe that you can change your body if you put your mind to it. Keep telling yourself that you will and can achieve your goals. Keep updated photos of yourself so you can see your transformation month to month. Make a log and set goals and dates so you can track your progress. Put up photos of people you look up to as a guide. Bodybuilding.com is my favorite site. It showed me other ladies who transformed their bodies and gave me the confidence to do the same. My prayers helped me get to this level of motivation and success in my fitness journey. The women and men who put their transformation stories on this site truly motivated me. I'm here telling others about my story 10 months later. I hope to inspire and motivate others who read my story. Bodybuilding.com helped me reach my goals and I will continue to share this site with others.